It takes a lot to impress SemiAccurate but at CES LG did just that with their rollable Signature OLED TV R. This device is hugely significant not for what it is but for what it usher in over the next decade or so. Lets start out with what the Signature OLED TV R is, other than a pretty clunky name. Think of it as the first in a new line of panels that can be fitted to non-flat surfaces, it opens up a whole new class of devices. More important is that if LG can make the R in a 65 inch form factor, smaller is quite possible too. We would love to tell you the specs of the R but LG didn’t release any yet. Given this is their halo product you can expect it is a 4K panel and that it won’t be cheap. 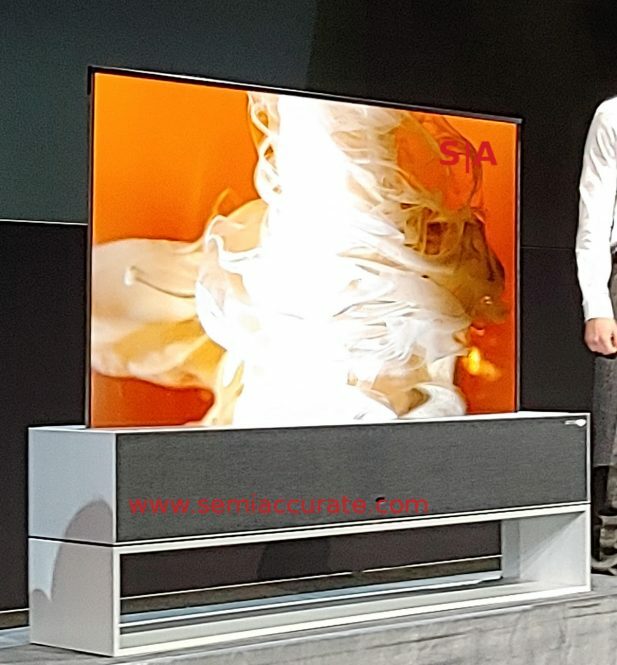 Then again, no one else has a rollable OLED panel so expensive is quite relative, you could say LG has the most inexpensive rollable large screen OLED TV on the market. It is interesting that LG didn’t stop with the tech, there are a lot of cool details on the R starting with the three modes. Full, Line, and Zero view. Full view means the screen is all the way up and it is a very nice 65″ TV. In line view it retracts so about 1/4 of the screen is visible and five options present themselves, Music, Clock, (picture) Frame, Mood, and Home Dashboard. They all should be pretty self-explanatory. In Zero view the screen retracts and the 4.2 channel 100W sound bar acts as a stereo. While we didn’t get a chance to hear how it sounds, based on their past audio devices and the fact that this is a halo product, we will guess it is an above average implementation. Not stopping there, LG introduced two new TV lines starting off with the 88 inch 8K Z9 OLED TV pictured above. The pictures don’t do it justice, the quality of this panel is stunning. During the press conference it looked 3D from the back of the room, the blacks were indistinguishable from the non-lit stage background. Once again as a halo device it won’t be cheap but it will be worth it, this is an amazing panel. The Z9 sports the second generation Alpha image processor with all sorts of image and sound enhancement features. 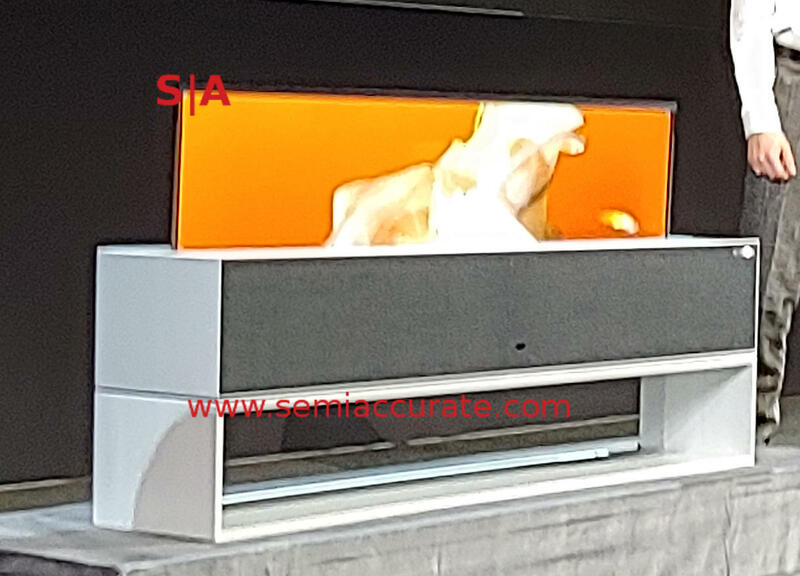 This gets a bit out of the area of SemiAccurate’s expertise so we won’t comment much on it other than to repeat the the demos look really good. Toss in the expected Google assistant and the not so shocking Alexa additions and you have a decent smart TV. More unexpectedly, LG added Apple AirPlay support for audio and video to the mix along with Homekit compatibility. This is a first as far as we can tell so if you want an always on mic that sends data somewhere for something you can’t control, LG is the only one so far to be able to do it all. That same Alpha 2 image processor is also in the new line of Nanocell LCD TVs. 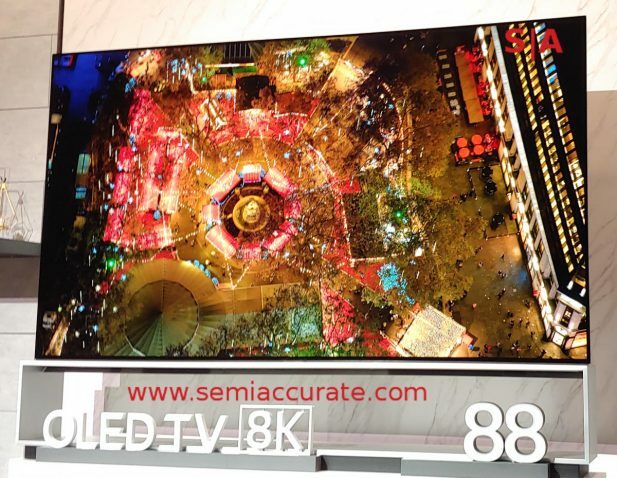 This new line encompasses the top of the line SM99 8K 75″ model as well as the lower end, relatively speaking, SM9x and SM8x devices. Why are these interesting? HDMI 2.1. That brings VRR and ALLM also known as variable refresh rate and auto low-latency mode. LG is claiming that these panels are finally good for gaming, something that depends more on the supported refresh rates than any specific input technology. If the panel supports more than 60Hz 4K/8K then these might be a tempting monitor for PC gamers, it could make FPS games workable from the comfort of your couch. As usual we will add the caveat that the details will make or break this claim but the potential is there.